The coconut definitives started out on a so-called chalky paper. Glazer (1997) documents in detail the manufacture and application of the chalk coating, which was outsourced to Samuel Jones & Co. of London. Calcium carbonate was doped with varying proportions of substances like kaolin, aluminium oxide, calcium chloride and calcium sulphate to get the desired consistency. Salts of the natural milk protein casein were added to chemically encapsulate the chalk mixture. Solvent was then added to make a slurry that was applied to the paper. Finally the paper was heated to evaporate the solvent and finished by passing it between rollers. The right side of this composite image shows the blue fluorescence of chalky paper under 365 nm longwave ultraviolet radiation. 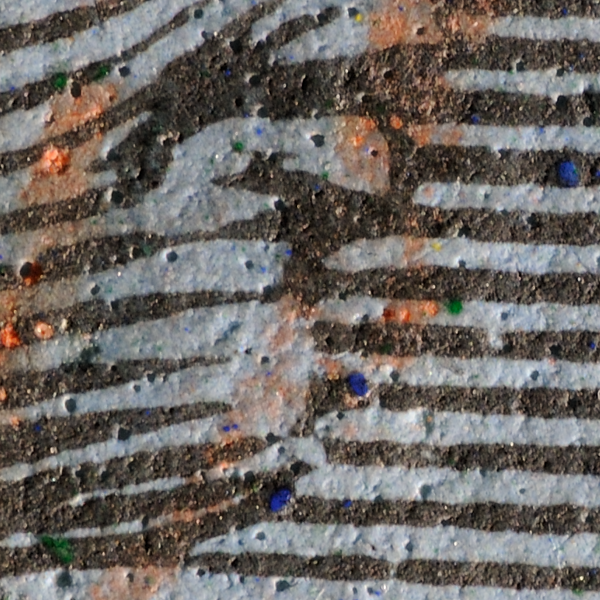 The chalk coating yielded a crisp print and vivid colours, as it prevented ink from spreading through the fibre network (Melville 1916, Glazer 1997). It also supposedly made the stamps less prone to reuse (Easton 1949, Watterson 2004). When soaked in water, the casein salts were supposed to dissolve, thereby releasing the chalk and ruining the stamp. 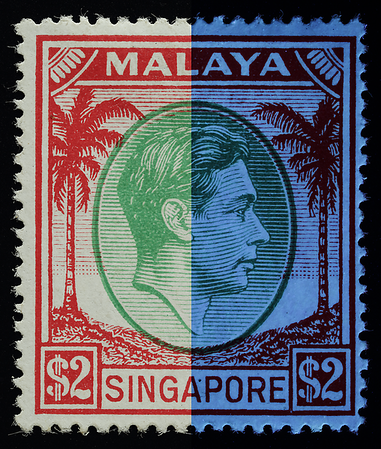 Glazer (2004), however, quoted the Crown Agents' former Chief Inspector of Colonial Stamps, Marcus Fauz, as saying that the paper coatings were meant to enable the use of certain inks and had nothing to do with fraud prevention. In addition, Fernbank (2013) mentioned that the coating was made “waterproof” using formaldehyde. Glazer (2004) also found that the chalk coating was often unencapsulated, making it waterproof and resistant to all but a very few dangerously corrosive reagents such as concentrated nitric acid. The "chalky" coating is more variable than is often realized. 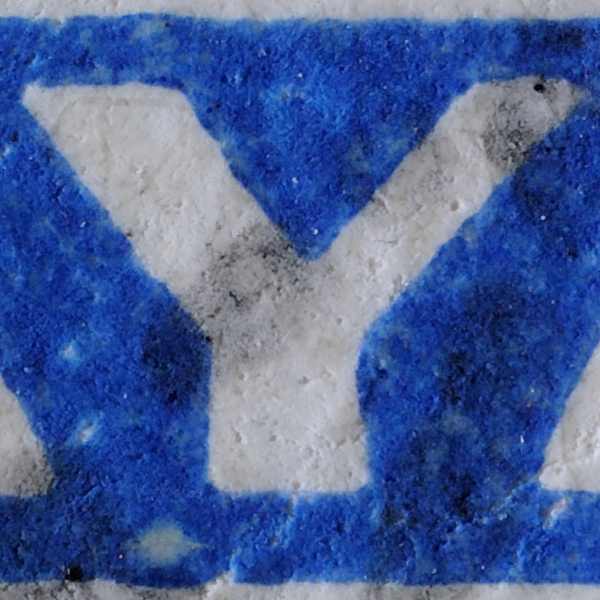 Glazer (2004) found varying compositions of calcium carbonate, calcium sulphate, kaolin and aluminium compounds on the coatings of KGVI stamps. The coating is distinctively pitted, perhaps due to heating, agitation or gas-producing chemical reactions. Blue pigment was mixed into the coating of this example, with contamination by green and even yellow pigment from the production of other coloured papers. The surface and pitting of this chalky coating appear worn. It is not clear whether it was made like this or was eroded over time. 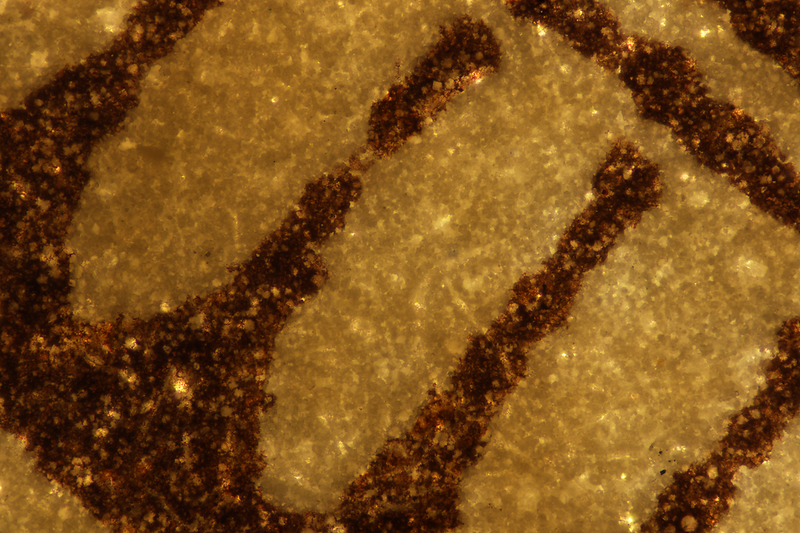 Photomicrographs (to the same scale) of chalky paper under transmitted Köhler illumination. The first known use of a compound optical microscope for the observation of the coconut definitive can probably be attributed to Rogers (1996), who observed differences in the visibility of fibres between chalky paper and rough paper (see later). Rogers used what he called a “conventional” microscope, which he distinguished from a philatelist’s pocket microscope. 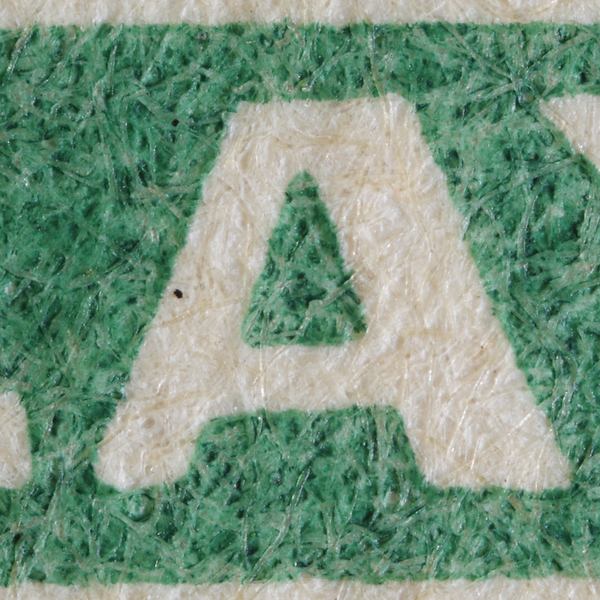 In 1941, as war raged in Europe and De La Rue was bombed, striated paper (Barker 1996) appeared. It is thin, about 85 μm compared with the 105 to 150 μm of chalky paper (author's measurements using a micrometer screw gauge). It has streaks running across the stamp, which may have been produced through a manufacturing process similar to that of laid paper. 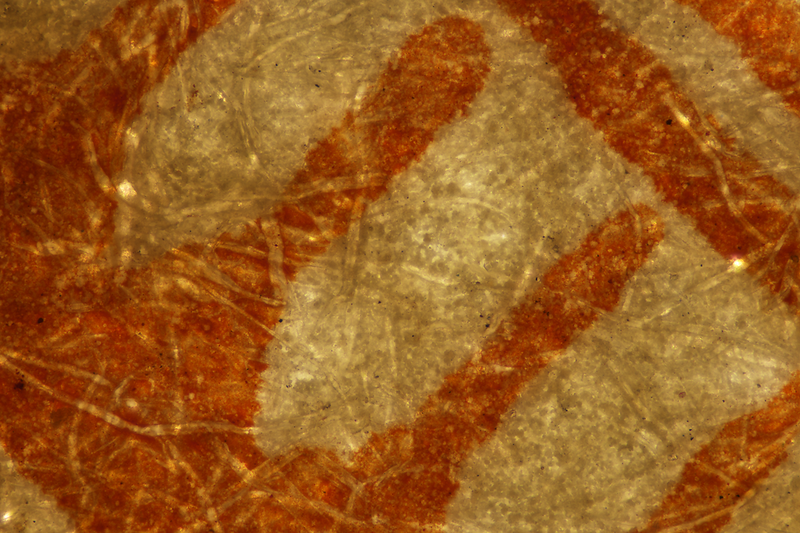 At high magnification under reflected light, striated paper shows some fibre and some coating. The coating is thin and appears to contain very little or no chalk. Although chalk was plentiful in the British Isles, it required casein salts as a binder (Glazer 1997). Milk however was strictly rationed during the war. Because of this the main constituents of paper coatings at the time were kaolin and aluminium oxide (Glazer 1997). Chalk would make a comeback in 1948 (Glazer 2004). 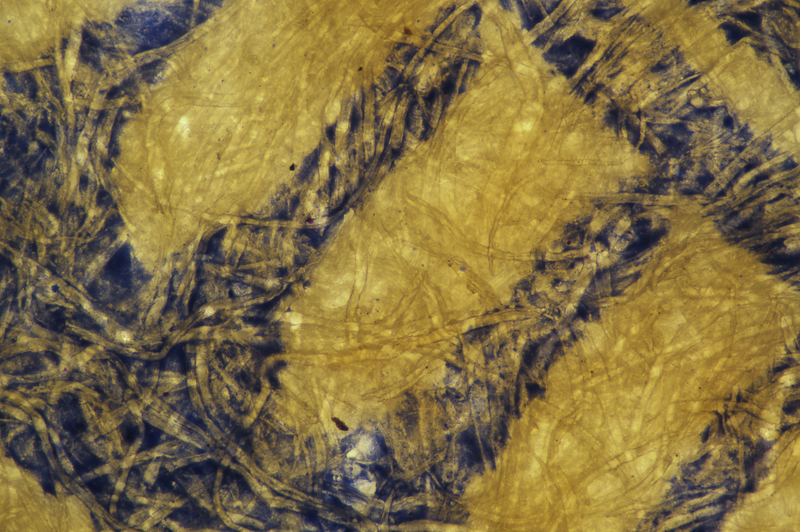 Fibres of striated paper under transmitted light. 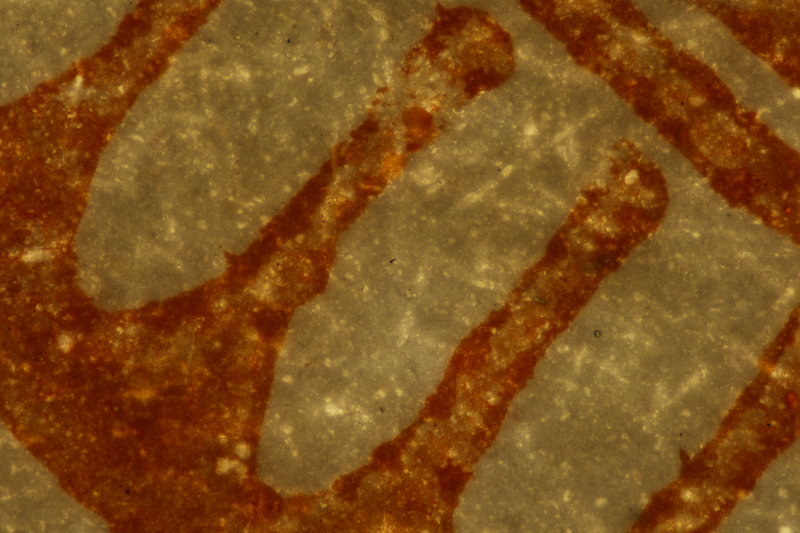 Photomicrograph of striated paper under transmitted Köhler illumination, with a field of view of about 1.8 mm along the diagonal. 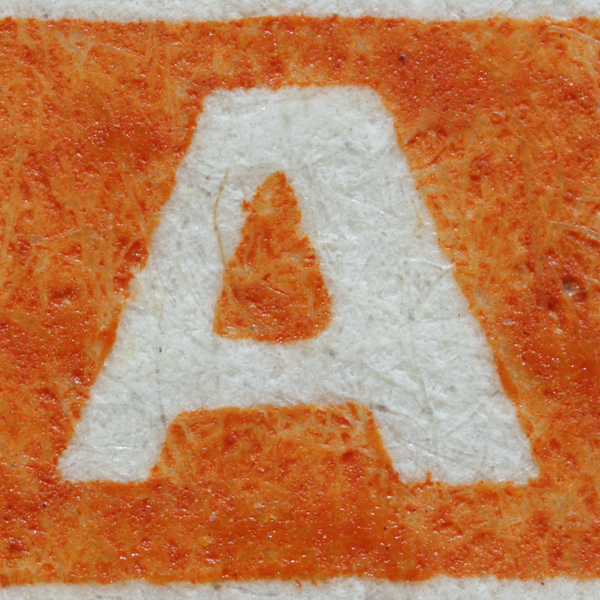 "Rough paper" appeared around the same time as striated paper. It had even more pronounced fibres on the surface and little or no coating. 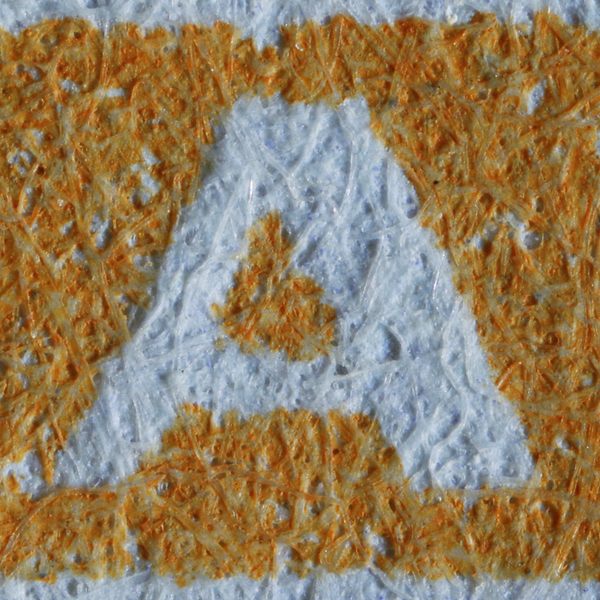 Photomicrograph of rough paper under transmitted Köhler illumination, with a field of view of about 1.8 mm along the diagonal. 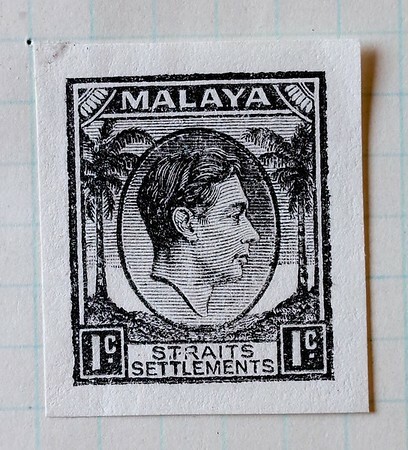 It seems that ink did not adhere to the fibres but was deposited in the spaces between the fibres instead, at least for the Straits Settlements 15 cents shown here. After the war a "substitute paper" (Barker 1996) emerged. Its coating appears thinner than that of chalky paper (Lowe 1951) and does not look like the latter. 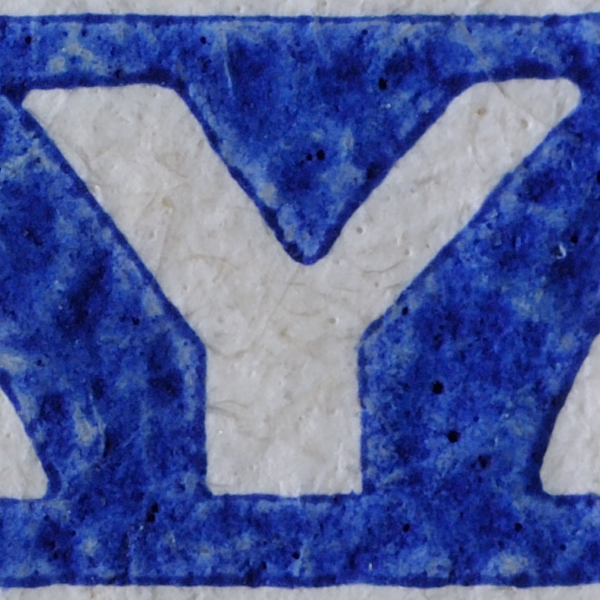 I suspect the coating is mostly kaolin (Al2O3·2SiO2·2H2O), given that many colonial stamps printed during and shortly after the war were found with kaolin coatings (see Glazer 2004). It also reminds me of a prescription of kaolin suspension I received for diarrhœa long ago. Kaolin, like chalk, is plentiful in Britain. It makes the paper more opaque and absorb ink more evenly (Glazer 2004). The only thing that will dissolve kaolin is concentrated hydrofluoric acid, an extremely dangerous chemical (Glazer 2004). These stamps were built for the most extreme conditions. 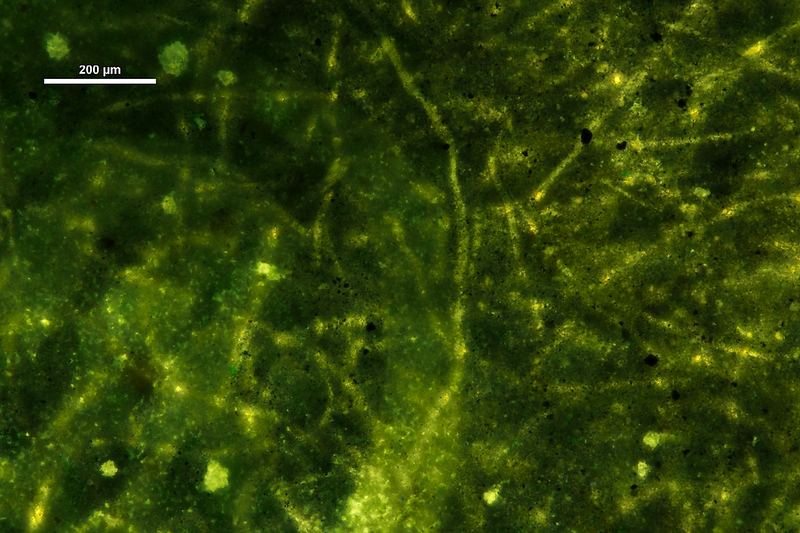 Photomicrographs of substitute paper under transmitted Köhler illumination. The lower image is twice the magnification of the upper image. Substitute paper is apparently not common, reportedly having been used only for certain issues for Ceylon, Hong Kong and Malaya (Lowe 1951). 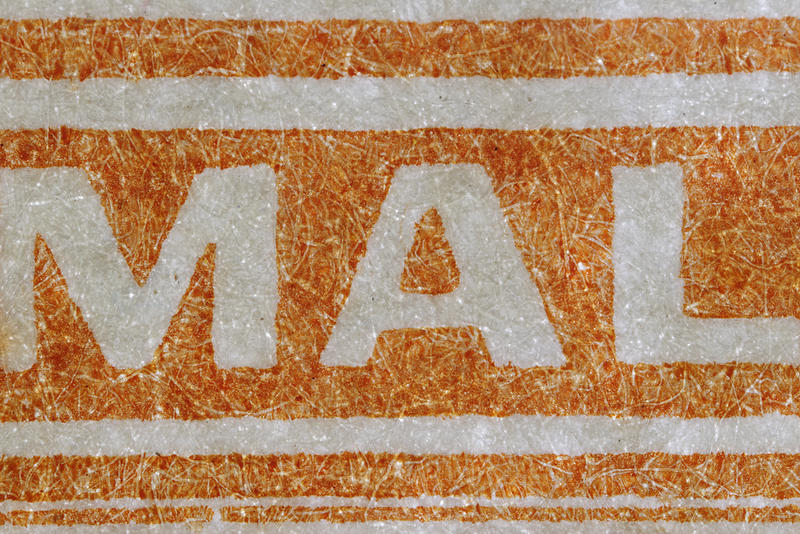 Printings often have a crumpled-cellophane quality, with the ink forming puddles and accumulating along the edges. This indicates that the coating was not very absorbent. Pitting may occur, as in this case, but it is usually less pronounced than on chalky paper. 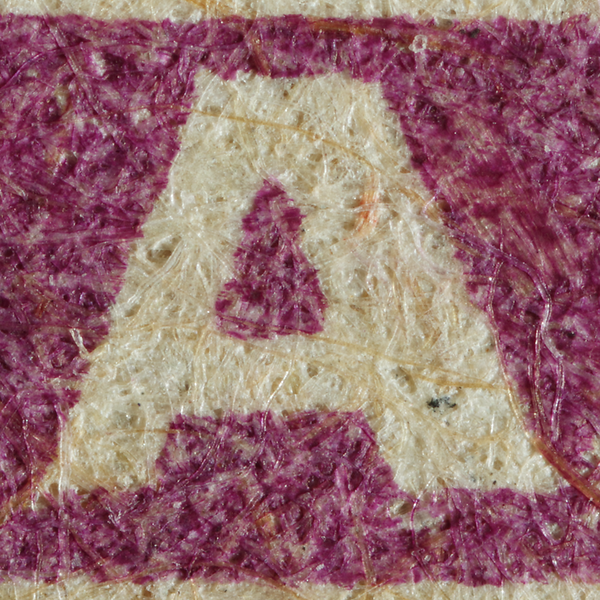 Additional paper types have been used for the coconut definitive but rarely noted as such. One of them is the uncoated buff-coloured thin card impregnated with slender brown fibres, used in postal stationery bearing direct prints of the stamp. The coconut definitive has also been printed on the even rougher aerogramme paper. An aerogramme is all about reducing weight. The paper is as thin and light as they dared to go, so much so that I wonder if they left out the coating for this reason. See Singapore 25 cents for more. Yet more kinds of paper were involved in the genesis of the coconut definitive. First there was the plate-glazed paper or "glazed card" used for die proofs. The paper, though uncoated, was given a smooth ceramic-like surface by pressing it with heated metal plates. 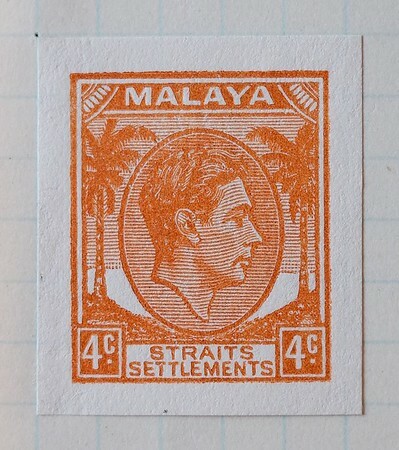 Ink texture on a specimen examined by the author (lot 586, Spink auction in Singapore, 28 October 2017) resembles that on substitute paper, with mottling and outlined edges, but gave crisp detail nevertheless. In early 1941, De La Rue experimented with what they called "uncoated paper", making some test prints apparently using individual cliches. They might have been testing cheaper paper for wartime use. The rough surface yielded terrible print quality. The duty plate of the 1 cent appears to carry the plate flaw of the dot between the "T" and "R" of "STRAITS". The author examined these samples in the Crown Agents, Philatelic and Security Printing Archive at the British Library. 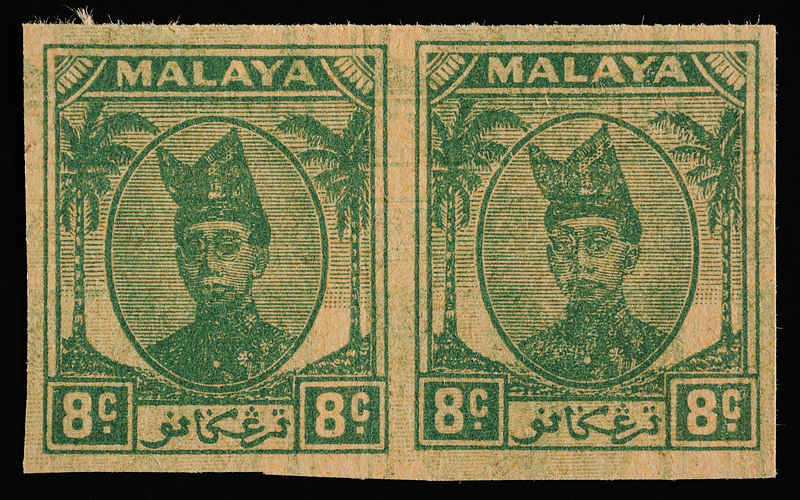 This so-called "plate proof", "printer's trial" or "printer's waste" on unwatermarked rough paper (Parr 1972, Stanway 2009), here showing Sultan Ismail of Trengganu, is similar in texture and colour to the buff-coloured card of postal stationery. This rare transitional stage between the die proofs and the production stamps was not officially recorded and may have served to clean the plate or remove excess ink; one occasionally finds the stamp of a different country on the same sheet (McClaren 2006)! 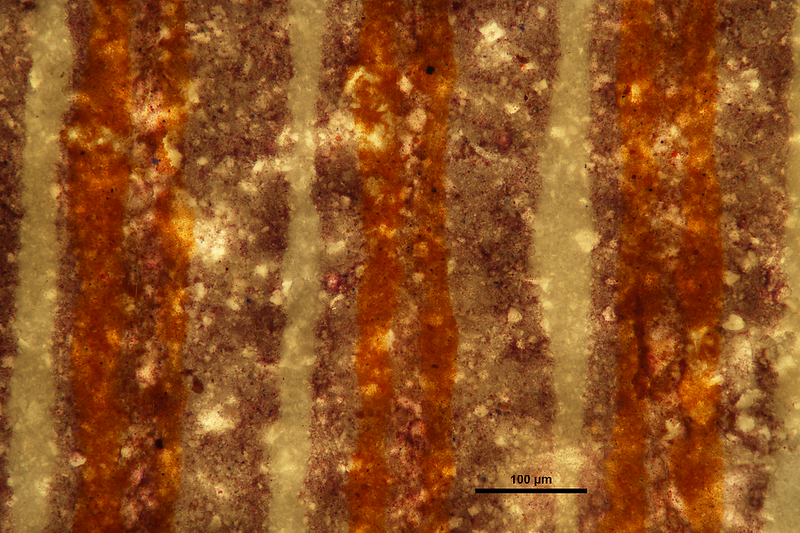 This piece has two unevenly inked blocks and faint overlapping impressions of additional blocks that suggest plate cleaning. This specimen is unusual as most plate proofs of the coconut definitives are devoid of additional plate-cleaning impressions. These trials were supposed to be destroyed but a few made it out of the 'gulag'. 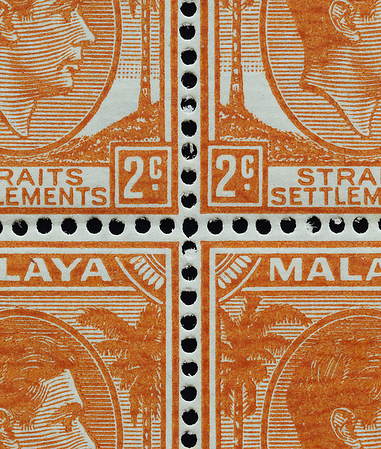 Veteran philatelist Len Stanway noted that nothing was supposed to get out of security printing works, not even off-cuts from sheet edges after guillotining (Lin 2018d). Plate proofs also exist in a rarer greenish grey paper of apparently similar fibre structure, here seen carrying the plates of Johore. Formerly in the collection of Dr Abdul Majid Dato Kassim. See Lin (2018a) for further discussion of circumstances surrounding plate proofs. 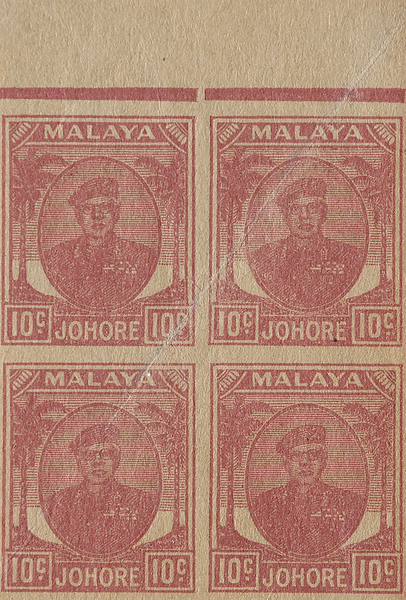 Mudie (2018) reported similar imperforate test prints apparently made on actual stamp paper further down the production line. Lin (2018d) proposed a possible source of the paper used for the plate proofs: could it simply have been the wrapping paper for the actual stamp paper? It would be big enough to take an impression of the entire plate. Why else would such a large piece of scrap paper be lying around? Stanway, however, argued that the paper used for test prints had to be of a consistent thickness and surface texture so as to expose plate anomalies, and that wrapping paper would not have been up to the task (Lin 2018d). The literature offers descriptions of the paper but stops short of hypotheses for its origin. Exploration in this direction could bring fascinating insights into the day-to-day goings-on in the printing room. I am grateful to Rein Bakhuizen van den Brink, David Beech, Paul Skinner, Benedict Sim, Ernest Cheah, Clement Khaw and Goh Wah Ing for discussions and technical assistance, and to the Nikon Imaging Centre at the Singapore Bioimaging Consortium for providing state-of-the-art microscopy facilities.